Shugeng Cao has his expertise in biologically active natural products from different sources, initially from plants, then from fungi and bacteria, and lately more on marine organisms. Besides drug discovery from natural sources, he is also interested in studying natural products in the fields of ecology and agriculture. At the Cancer Center and Daniel K Inouye College of Pharmacy, University of Hawaii, his lab has collected about 300 bacterial and more than 2,000 Hawaiian fungal strains from soil, marine and endophytes. A natural product library with more than 5,000 semi-pure fractions has been established, and it has been partially screened against a few cancer cell lines and human pathogenic microbes. Part of the library was also screened against plant pathogenic strains Ceratocystis fimbriata and Fusarium graminearum. A few strains in the library were confirmed to be active against the above-mentioned two plant pathogenic strains. “Rapid ohia death” caused by fungi Ceratocystis fimbriata and other Ceratocystis species is a new fungal disease that is currently attacking and killing ohia tree (Metrosideros polymorpha), the most abundant native tree in the state of Hawaii. The prevalence of “corn ear rots” (maize: Zea mays L.) caused by pathogenic fungi (e.g., Fusarium graminearum) in tropical and sub-tropical regions such as Hawaii is particularly troublesome because multiple yearly cropping cycles allow the pathogens to develop large populations, and additionally, these fungi create mycotoxins that are harmful to humans and livestock when consumed. Screening of our natural product library followed by assay-guided separation of two hit led to the discovery of a few polyketides from marine fungi FT361 and FM324, which showed potent inhibition against Fusarium graminearum. A microbial metabolite strongly inhibited both Ceratocystis fimbriata and Fusarium graminearum. Figure 1: Ohia trees attached by Ceratocystis fimbriata5 (left) and a corn infested by Fusarium graminearum2 (right). Figure 2: Fusarium graminearum inhibited by multiple fractions; from FM361 (left), two fractions from FM324 (middle), and a microbial metabolite (right). Niroshini Nirmalan graduated from the Faculty of Medicine, Colombo, Sri Lanka in 1991 and she was appointed as a Lecturer in Parasitology at the Faculty of Medicine Colombo. Niroshini Nirmalan completed her MSc in Molecular Parasitology at the University of Salford in 1995 and was awarded the Overseas Research student Award to do PhD. and done her postdoctoral training in Prof John Hyde’s laboratory at the University of Manchester Institute of Science and Technology (UMIST) and went on to work as a Post-Doctoral Fellow at the Manchester Interdisciplinary Biocenter (MIB, University of Manchester. Currently she is working in a role as Senior Lecturer at the University of Salford in April 2010. Since gut microbiota influences obesity and bone mineral density, probiotics, prebiotics and synbiotics may attenuate menopausal symptoms by modulating gut microbiota in estrogen-deficient animals. We investigated whether the long-term consumption of L. fermentum (probiotics) and cauliflower mushroom (prebiotics) would prevent and/or delay the progression of post-menopausal symptoms in estrogen-deficient ovariectomized (OVX) rats with diet-induced obesity and explored their mechanisms of action. OVX rats were fed with high fat diets containing 1% dextrin (control), 1% lyophilized cauliflower mushroom plus 0.1% casein (CFM), 0.1% L. fermentum plus 1% dextrin (LFE), 1% CFM plus 0.1% LFE (CFLF), or 30 μg/kg body weight 17β-estradiol plus 1% dextrin (positive-control). CFM mainly contained β-glucans (about 95.8%). OVX exhibited impaired energy, glucose and lipid metabolisms and changed gut microbiome, and 17β-estradiol treatment prevented the impairment. Only CFLF lowered tail skin temperature without increasing serum 17β-estradiol and uterine index. CFLF and positive-control groups increased daily energy expenditure and fat oxidation. Dyslipidemia induced by OVX was improved by CFM and CFLF and CFLF prevented the dyslipidemia as much as in the positive-control group. Serum glucose levels and insulin levels were lower in CFLF as much as in the positive-control group. HOMA-IR was rather lower in CFLF than in the positive-control. Hepatic insulin signaling (pAktàGSK-3β) was also potentiated in the ascending order of the control, LFE, CFM, CFLF, and positive-control. AMPK phosphorylation showed similar patterns of hepatic insulin signaling but LFE increased it more than CFM. OVX increased the ratio of Firmicutes and Bacteroidetes and decreased the ratio of Actinobacteria plus Proteobacteria in the large intestines. The changes were prevented by CFLF as similar to the positive-control group. 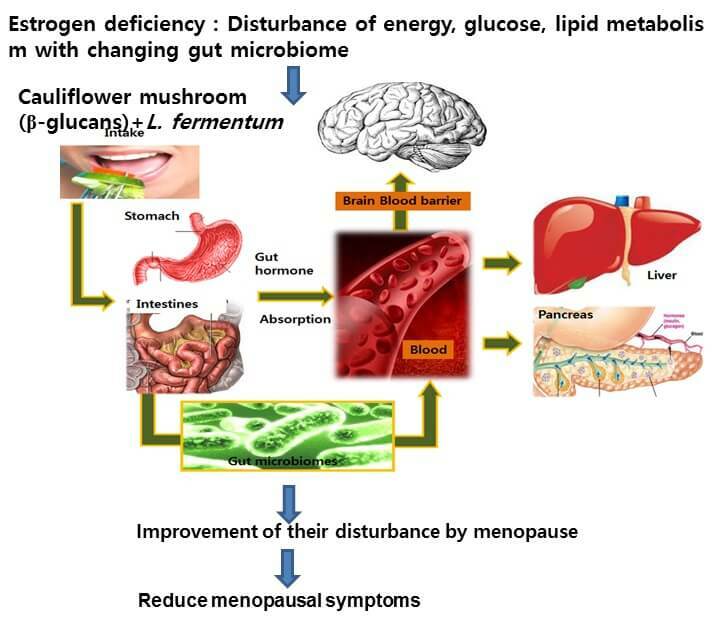 In conclusion, OVX changes gut microbiota and the changes were associated with menopausal symptoms and synbiotics of CFM and LFE prevented the gut microbiota and menopausal symptoms in estrogen-deficient animals.